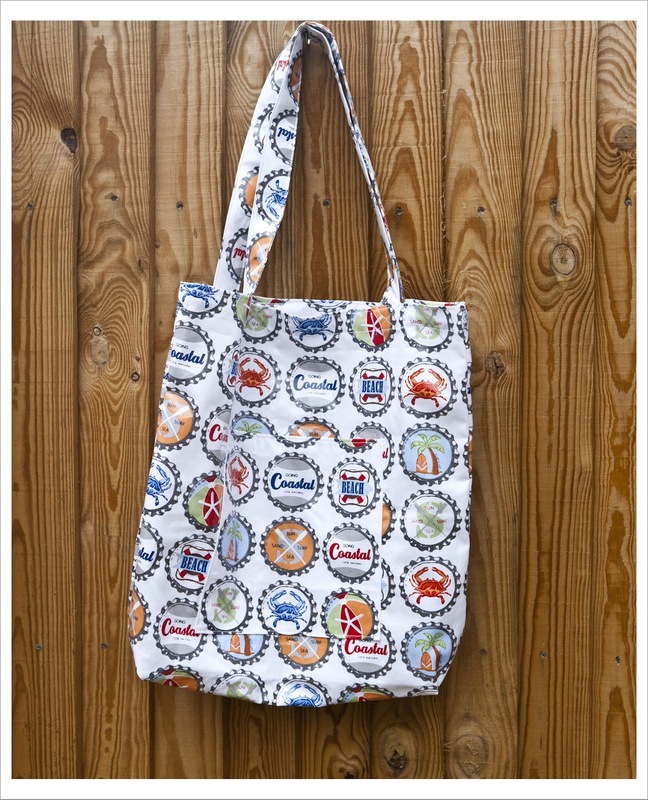 needles and lemons: Beach bags or grocery totes ? 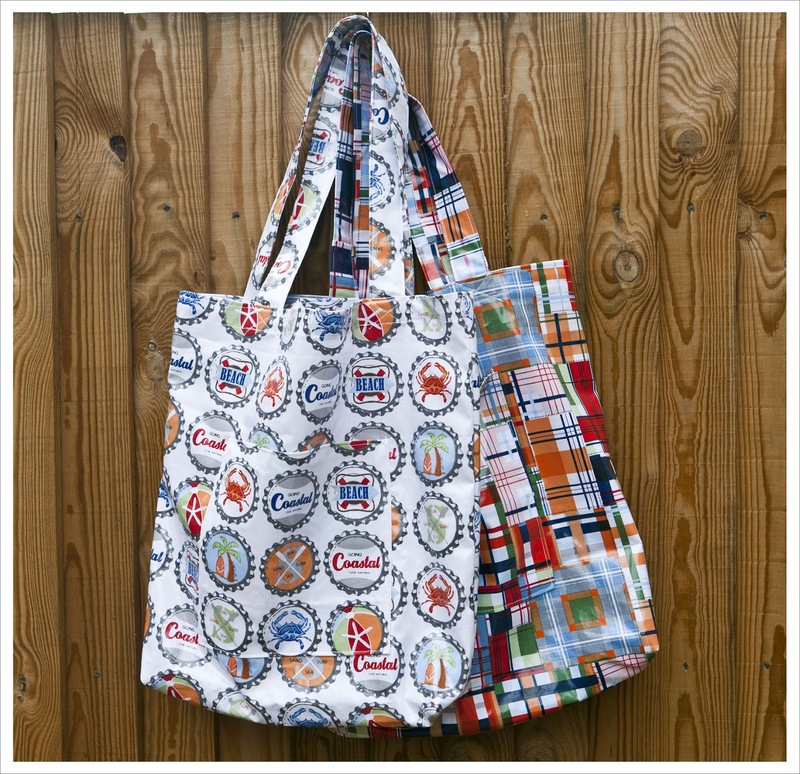 Beach bags or grocery totes ? Last Summer when I went to the Southbank Craftfair I made a couple of totes in preparation but never took any photos of it. I didn't sell them and have used them ever since for grocery shopping. 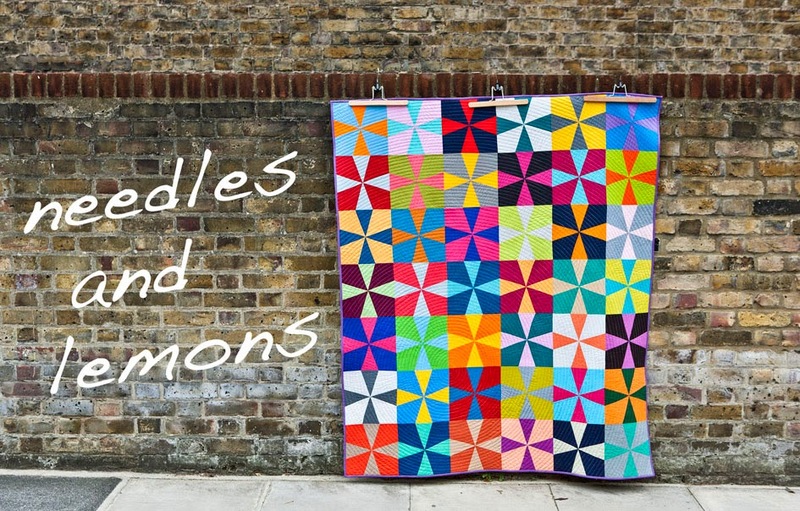 A few weeks ago my lovely friend Leigh spotted them and asked me to make her a couple too. I was only to happy to oblige. 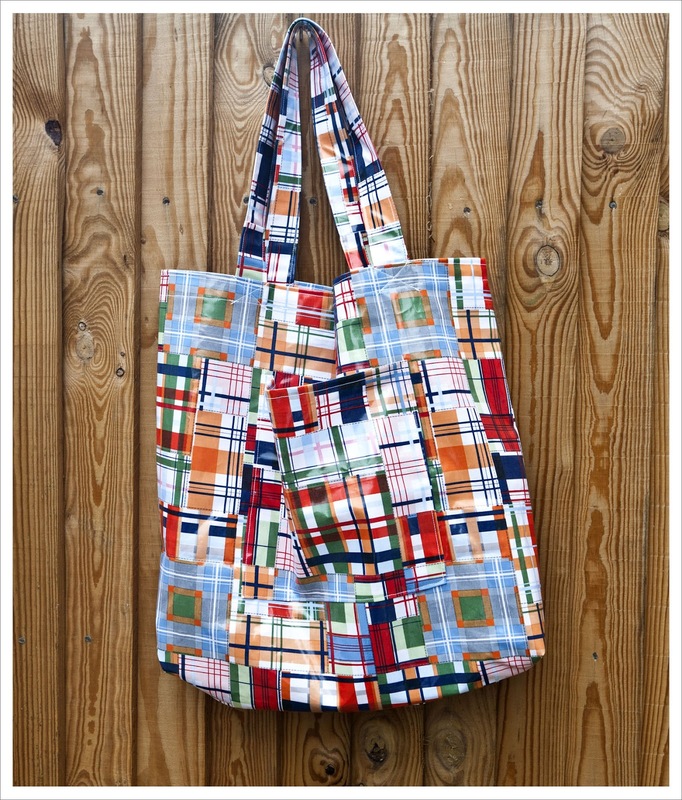 I made the bags from a laminated version of the 'Going Coastal' fabric from Crazy Old Ladies. I used this tutorial which was very easy to follow. Sewing with laminated fabric can be a little tricky as it has a tendency to slip in the machine. It also doesn't like pins very much. But it was still fairly easy and I did not have any problems sewing the bags. I have read on many blogs over the years to which length people go through to be able to sew laminate (putting tape under the sewing foot etc) but the solution for me was simple; I used my walking foot throughout the whole process. And I really don't think you need anything else (that is if you have a walking foot). By doing so the fabric went smoothly through the machine. Pinning is a bit of pain but this is a simple bag with a little pouch at the front and really doesn't need all that much pinning. The most I pinned where the straps. Last year in October Laurie Wisbrun sewed herself a gorgeous raincoat from laminated fabric. She used clover clips instead of pins and can you read in this post her experience of sewing with laminate. What astonished me most with this fabric is how incredible durable the bags are and how much weight they can carry. This is after all normal quilting weight which happens to be laminated. When I go shopping with my scooter I have regularly both bags full, one hanging from each handlebar. And with full I mean heavy stuff, such as pints of milk, juice, apple etc., we are talking up to 4 kg at times. And the bags are large enough also to take to the beach which is where they really belong. Looking great and useful, can't ask more than that! I'm with Hadley, they're fab! Bags are incredible. I've made a few and am still stunned how something I've made with just a few seams can hold so much! Yours are looking lovely. Those bags are brilliant Judith! I'm fancying a laminated tote myself now!